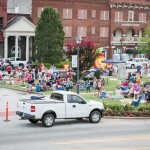 Blankets, lawn chairs, and families sprawled across the grass filled the square in Edgefield, Friday night, June 26, as hundreds of children and adults came to enjoy Movie Night on the Square. 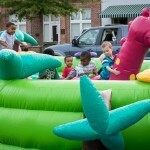 The event, hosted by Antioch Baptist Church, the Edgefield Community Development Association, and the Town of Edgefield, was threatened by predicted thunderstorms. However, the storms went around the town and, instead of raindrops, brought cooler temperatures to make the evening that much more enjoyable. 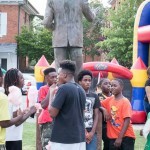 Along with the nice weather and the showing of The Lego Movie, there were inflatables, pop corn, sno cones, cotton candy, and water and tea for the families to enjoy. And best of all – it was ALL free! There was even a drawing for free Lego sets. 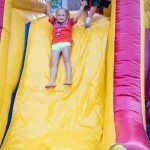 The Advertiser spoke with many in attendance, and the overwhelming feedback on the night was one of amazement that a small town would hold such a free event. 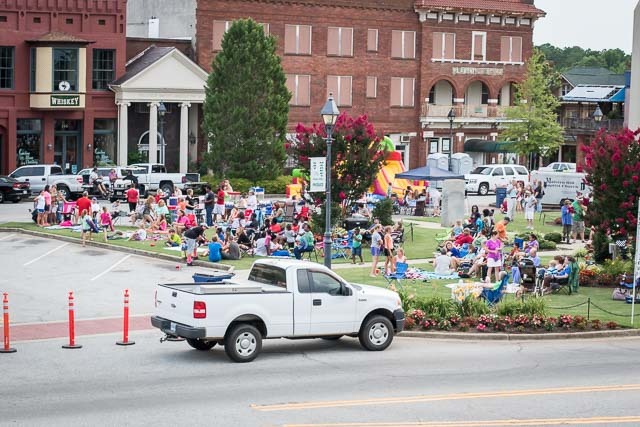 One woman with two small children in tow said, “I can’t believe all of this is free!” Another woman from Aiken, who said she had read about the event in The Advertiser, raved about how much fun the night was and wanted to know when would be the next movie night. 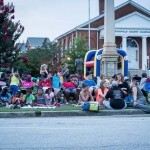 A mother whose family has just moved to the Edgefield area from Florida said she had never seen or heard of a town offering such an event before. She was so amazed that she was sending pictures throughout the night back to family members in Florida, who were also astounded. 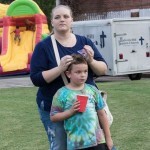 She said that she was especially impressed that, being hosted by a local church, there was a short devotional and prayer before the start of the movie. 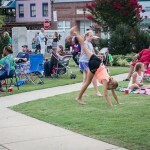 As for future Movie Nights, McMullin said the ECDA is hopeful to bring at least two more to the square with one tentatively set for October. 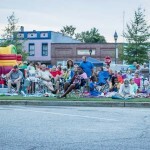 However, with Edgefield’s full calendar of events – the Cruise-in, the Rodeo, and the Heritage Festival – firm dates on these future Movie Nights have not been set. The Advertiser will again herald Movie Night’s return when the dates are announced.